Anne Marie Velliquette, from left, Jordan Platt, Michael Johnson, Heather Blunt-Vinti, Sarah Stokowski and Blakely Low are some of the faculty and staff members who worked on the proposal and will help implement the project. The University of Arkansas has been awarded a $30,000 grant from the NCAA to educate students about the dangers of excessive alcohol usage. The NCAA CHOICES grant, to be awarded over three years, will help establish a registered student organization to be called Razorbacks Offering Alcohol Resources, or ROAR, that will lead a public information campaign aimed at reducing alcohol abuse among U of A students. The campaign will include student-led initiatives such as bystander intervention training, public service announcements, alcohol awareness week and sober spring break. The grant project is a partnership among the College of Education and Health Professions, the Department of Intercollegiate Athletics, the Sam M. Walton College of Business, Substance Education and Alcohol Resources, New Student & Family Programs, Housing, the U of A Police Department, Greek Life, and Counseling and Psychological Services. The proposal offered several statistics about alcohol use in general and on the U of A campus, specifically. According to the most recent alcohol statistics, 19 percent of U of A freshman students in 2014-15 drank alcohol and demonstrated high-risk drinking behavior such as binge drinking, taking shots and chugging alcohol. Forty-one percent of the sample reported blacking out because of alcohol consumption, and 53 percent reported experiencing a hangover. 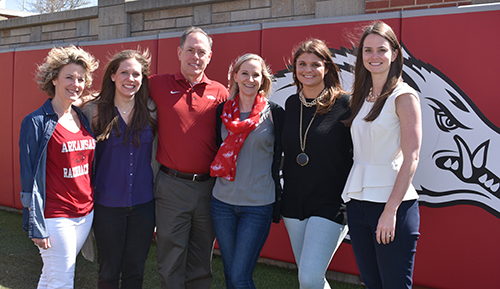 Given that the University of Arkansas student population continues to grow and members of Greek life, student-athletes, and first-year students (which together comprise nearly 40 percent of the student population) are considered at-risk in regard to alcohol abuse, it is vitally important to integrate students into a campus-wide effort to reduce alcohol abuse in line with the university’s “students first” mentality, according to the proposal. Students enrolled in the integrated marketing communications course taught next fall by Anne Marie Velliquette, a clinical professor of marketing, will develop a marketing campaign to roll out in the fall of 2019. Other faculty and staff named in the proposal with Stokowski, Velliquette and Ratcliffe are Michael Johnson, director of clinical and sport psychology in the athletic department; Heather Blunt-Vinti, assistant professor of community health promotion; Asher Morgan, director of Substance Education and Alcohol Resources in the Department of Wellness and Health Promotion; Blakely Low, assistant director of clinical and sport psychology; and Erica Nelson, director of student-athlete development. Parice Bowser, director of Greek Life, also said the organization is excited about this student-led collaboration that will encourage responsibility and accountability.